The Queensland branch of The Australian Hovercraft Federation held a planning meeting on Tuesday, 16th April 2013, in the Staff Room of the RC primary school, 350 Mortimer Road, Acacia Ridge. Other members attending were Arthur Stead, Dale Baxter, Neil Budworth and Brandon Bull. Cruise report - Muriel St, Redland Bay - Saturday 13th April 2013. The last club cruise was held on Saturday 13th April 2013, launching from 96 Muriel Street, Redland Bay courtesy of Peter Venn. Angus Kerr Viper powered by a Subaru 1800 EA81. Brandon Bull Turbo Wedge 225 powered by a 1600cc Subaru. Sam Waugh Revtech Renegade powered by a Kohler 4 stroke. Arthur Stead, Ann & Amelia Torrance, Rita Chaffey and Dale Baxter. We started off with a show and tell of Peter’s new 37hp Vanguard Briggs and Stratton engine in the white Expo Turbo 240. The engine is installed, but has no transmission set up at this stage. Peter does however have the basic controls, air intake and exhaust connected and was able to start the engine for impressive sound effects. 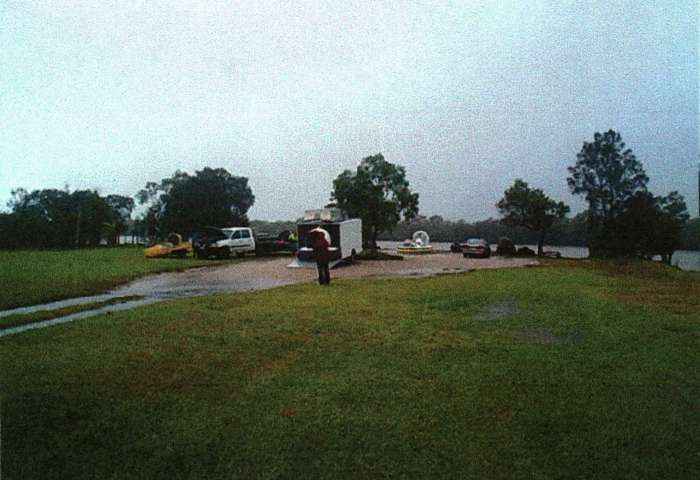 The April cruise was held at 96 Muriel Street and launch took place from Peter and Elaine’s private boat ramp into Redland Bay Chennel. We had 4 craft on the estuary terrace but only 3 on the cruise. The TP6 powered by a Subaru 1800cc thrust engine and a 21hp single cylinder Briggs and Stratton lift engine carried Peter Venn and Cle Sheck, the Viper carried Angus Kerr and Brandon Bull and our guest from NSW Sam Waugh followed in his Revtech Renegade with a Kohler engine spinning a 1 metre integrated lift / thrust fan. Due to the persistent rain they kept the cruise short, however it wasn’t long before mechanical problems plagued their adventure. Angus’ craft failed first with a steering bell crank separating from its floor mount. Peter Venn came to his assistance and a short piece of rope was used to tie off the base point of the steering shaft to give some limited control. Angus was able to continue rather than turn around for the shortest distance back to the boat ramp. The rescuer than became the next victim of mechanical problems when 3 studs became loose in the complex vibration dampened lift fan hub on Peter Venn’s TP6. Luckily Peter had time to throttle back and then shut down his lift engine before permanent damage occurred. With a single sheet drag flap on the rear skirt segments Peter was able to complete the cruise at a marching pace by barging through the water with the Subaru thrust engine only. Sam Waugh in the Revtech Renegade had no break downs and returned at slow speed after staying with the two stricken home side craft. Peter Venn recently updated his lift engine from a twin cylinder Honda 17hp to a single cylinder Briggs and Stratton 21hp engine. The lift fan failure rate has increased significantly with this modification in power source. A single cylinder engine has more dynamic rotational stress on aluminium fan hubs than a twin cylinder engine. The advantage on the other hand is the reduction in fan resonance and better lift air supply due to less obstruction of the intake air flow. Safely back on land, we held a barbecue lunch for our interstate visitors: Sam Waugh and Lorraine Brighton of Primbee (south of Sydney) enroute to Maryborough for a motorbike club AGM and then heading north into Cape York Peninsular. In attendance were Peter and Elaine Venn, Arthur and Judy Stead, Angus Kerr, Ann Torrance, Brandon Bull, Amelia Torrance, Steven Odgaard, Rita Chaffey and Dale Baxter. Dale brought his new swamp boat along for show and tell. It is powered by a V6 Holden Commodore engine and powers a 6 foot carbon fibre 2 bladed propellor. It was constructed on the Gold Coast and has a good quality finish. Dale only just returned from Woollongong NSW where he purchased it in half share with his father. Another cruise - Sunday 14th April 2013. The next day saw a clearing in the rainy weather and Neil Budworth turned up for the club cruise right on time at 9:00 am - except it was the wrong day. Peter and Sam decided to make the most of the perfect cool sunny morning to enjoy another quick cruise before Sam and Lorraine were due to pack up and leave for Maryborough. Sam invited Peter to try out the Revtech Renegade which ran well on the club cruise the day before. Neil Budworth and Sam Waugh took off down the Redland Bay Channel at high speed in the Turbo 265 powered by a Rotax 562 two stroke water cooled engine. Peter realised that he was falling behind and powered up to maintain a good pace. He began to notice a vibration and thought it was an unbalanced fan, but it was worse. A loud bang occurred and the fan stopped even though the engine was still running. Peter shut down and quickly realised that he was beginning to sink. The transmission shaft had broken at the rear floor mounted bearing housing and briefly spun around out of balance causing a large hole to be smashed through the engine bay floor. He grabbed a bailing bucket and held his hand over the hole behind the engine. If this was not bad enough, two Maritime inspectors from the department of Recreation and Racing (formerly the EPA) arrived on the spot and asked Peter whether he had a permit to operate on Moreton Bay Marine Park. Trying to stay cool and calm, Peter stated he has a permit however he does not have a copy on board. Neil and Sam then returned and fortunately Neil had a copy of his permit with him when asked the same question. The inspectors then offered assistance however Peter preferred to be towed in to the closest mangrove bank by the other hovercraft to make temporary buoyancy repairs. 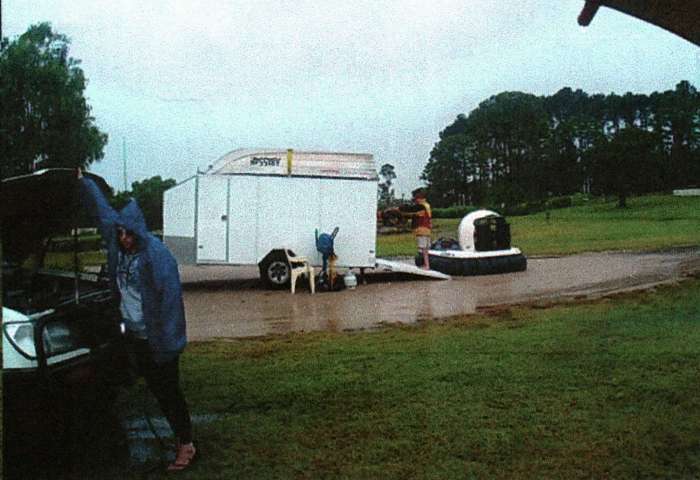 The boat was not able to assist in towing over the shallows, but the inspectors offered to return in an hour to check if they required additional help with the long slow tow back to the boat ramp. On shallow mud Peter was able to jam a singlet tightly into the hole and then Neil and Sam proceeded in towing the stricken craft back to base. Neil applied full thrust which caused a lot of mechanical stress and loud noise and continued to cover Peter with high velocity wind and spray. Peter forgot to cut the rear skirt segments and now the skirt was acting like a sea anchor. There were only a few kilometres to travel, but he returned in the worst possible conditions, still bailing frantically to remain afloat. 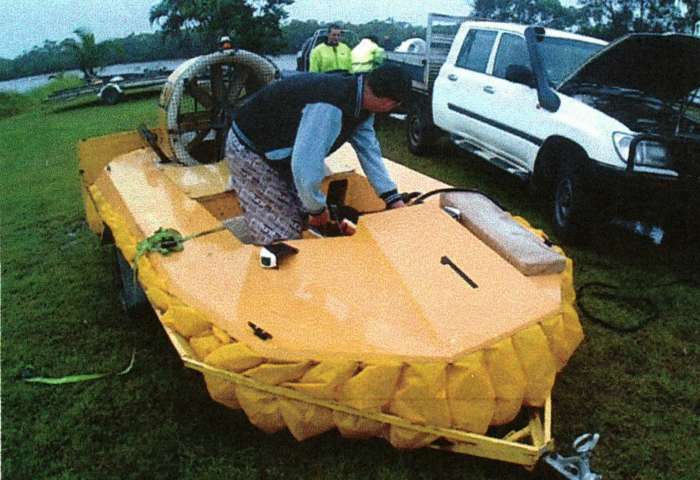 Unfortunately Sam had to leave for the Maryborough AGM and North Qld without his much loved hovercraft. The Revtech Rengade is now sitting in Peter’s shed awaiting return to Primbee for repairs. Sam attended the AGM and set up the motor-home in the camping grounds, however he returned on Tuesday 16th April to assist Peter Venn in cleaning the engine and computer management system in the Renegade. Not a very good month for the Queensland Club cruise diary. On Friday 19th April 2013, Ben Woodhead joined the club as a new member. Ben has completed more than 3 cruises with the QSH club and he did this is his own craft. A Suzuki powered Turbo Vortex which he modified after a purchase from Phil Audsley. 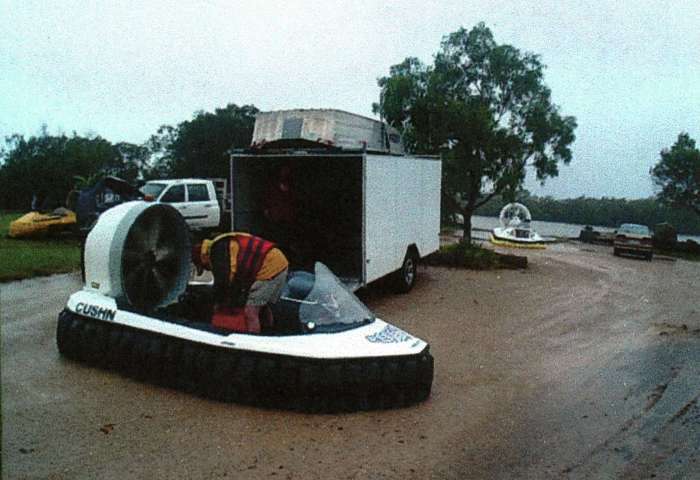 On the weekend of 28th & 29th of September 2013, the NSW Sporting Hovercraft Club will host the Australian National Rally at Wyangala Waters, about 3½ hours west of Sydney. This should be a great rally so if you are thinking of coming, check the details from the link on the Home page of this site, book your accommodation early (its the middle of the busy school holiday period), and remember to register online. Well, the hovercraft world just got a jump start from above. Found a couple more chaps building hovercraft and one who wants one now! Potential club members I recon. I have been doing my hovercraft blog for over a year now. It seems people are reading up. I was starting to wonder if anyone read my ramblings. The hovershuttle is a bit of a problem child with potential to actually work. See the blog for the nitty gritty. wwwhovercraftwa.com.au. It is starting to work after alot of TLC - lots more required to put it on the water. It is however registered here in the west now. Good to hear of your adventures blown fans and all. It happens to other people too, are my thoughts! I would really love to join in the Rally fun. I’d better start on the wife now. Which craft would I bring I wonder. Might have to build something outrageous for the event. The next club cruise will be held on Saturday 4th May 2013 at Muriel St, Redland Bay. The next club meeting will be on Tuesday 21st May 2013 at 7:30pm.